The coast between les Grands Sables and the Sables rouges beach counts many crystal coves that I like to call the VVF beaches. 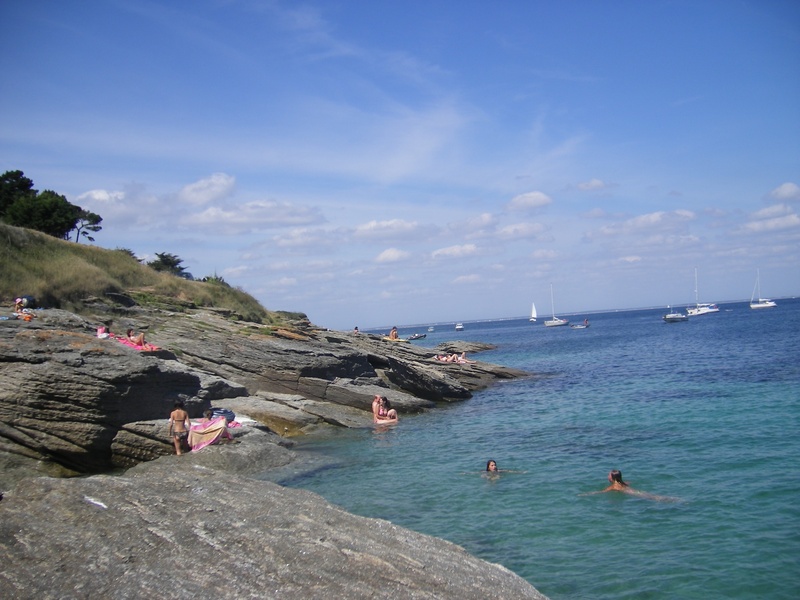 VVF means « Village Vacances Famille », and it may be where you have decided to stay when in Groix. This is a holiday residence : you’ll spot the little houses from the road. The beaches in the area are nestled between the rocks, which sometimes make their access difficult, but the somewhat hard descent is really worth it. Especially at high tide, the color of the water is exquisite : sea-through turquoise, really Caribbean-like ! The sand is thin, white and occasionally red, due to the garnets and mixed with seashells. With kids, the best is to go to the main beach which is served by stairs. It is also the largest. On the other hand, if you’re looking for a Robinson Crusoe experience, you’ll easily find a wild spot between the rocks with your own private pool ! This is a nice place to go snorkeling, especially at high tide. Coming from the road passing by the holiday residence, you will have one of the most impressive views on the island : white sand and blue waters. No question asked, you will know you’ve made the right choice when coming to Groix !